The Coleman Perfect Flow Grill Stove is a portable split camping grill/stove with a 2-in-1 design perfect for multi-tasksers. This grill has been designed to be effective and efficient, with features such as adjustable burners, side wind block panels, and even non-skid feet. “Wind Block” side panels help shield the burners from wind (they can also be used as side tables). 20,000 BTUs of cooking power. Fits a 10 in pan on the stove area. 130 square inches of grill area. Removable grease tray to make cleaning as easy as possible. Non-skid feet to provide a sturdy cooking surface. The cooktop is made from aluminized steel. The 16.4 oz propane cylinders used for this grill stove can last for up to 2 hours with burners on higher—an adapter can also be used to hook the grill directly into a 20lb propane bottle rather than using the smaller disposable bottles. Total weight of the unit is 15.26 lbs. Overall, the Coleman Perfect Flow Grill Stove received 5 star reviews from the majority of consumers, with users particularly appreciating the size and versatility of the grill. Its size allows for a substantial amount of food to be cooked at one time (even different types of food given the dual stove and grill features) while still remaining small enough to be easily portable to remote locations. 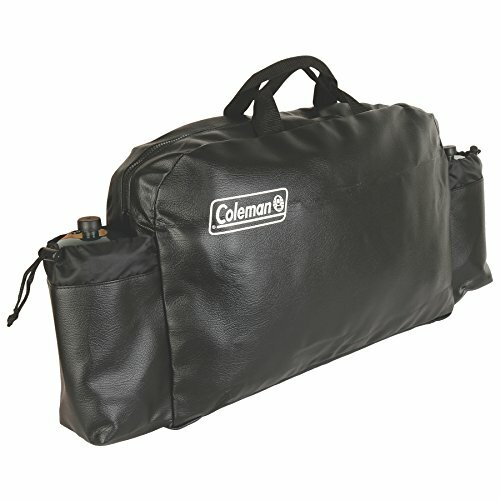 Additionally, features such as the side wind guard flaps, the grease tray, and the non-skid feet provide additional comfort and efficiency when using the Coleman Perfect Flow Grill Stove as well as cleaning it. Main complaints included marks or dents on pre-used unit, frustrations with the lack of pushbutton ignition on this particular unit, and sensitivity of the stove adjustment buttons. Ultimately, this unit could be a good purchase for the regular outdoor cooker who wants access to a moderately sized stove AND grill without sacrificing portability and convenience. With both a grill side and a stove side the Coleman Perfect Flow Grill Stow allows for seamless cooking. For example, meat can be grilled at the same time a side is being prepared on the stove. Each burner can be individually adjusted allowing for a personalized cooking experience. Removable grease tray makes it easier for the owner to clean. Compact size at only 6.5x15.5.23.75 inches makes this stove easy to transport and set back up. Wind block side flaps help protect the flame from any wind and the flaps can also provide a side table space to be used during the cooking process or even to eat afterwards. Users have reported that the wind guards do help, and the stove and grill can be used effectively even in high wind conditions. Good quality for the low price—reviewers have deemed this to be a good value item. The assembly for the stove is fairly easy. Both the stove and grill cook the food well, with reviewers noting that it was comparable to having cooked their food on a kitchen stove. The unit cools off quickly, allowing it to be packed back up or stored as needed. 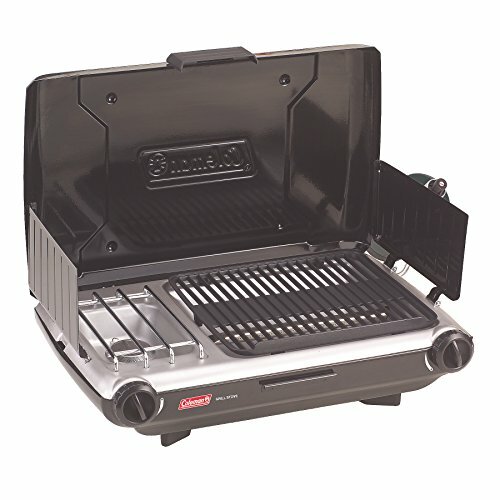 No pushbutton ignition option on this model of the Coleman Perfect Flow Grill Stove—to light the grill one must use long matches or a lighter. Some consumers reported receiving units with defects in the bottom—these defects looked to be large dents or pit marks. When on, the stove makes a loud “blowtorch like” sound that may disturb those around if used early in the morning or late at night. Users have reported that though the two burners are adjustable, there are essentially only two settings (high and low) and the knob is over-sensitive, leading to difficulties setting the stove to an appropriate level of heat. 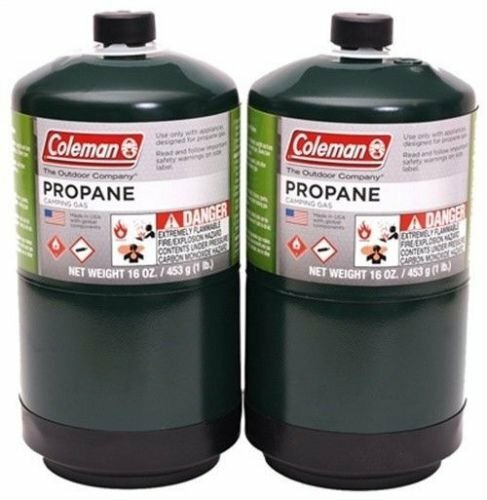 Fits Coleman® propane stoves, grill/stoves and camp grills up to 23.5" X 4.5" X 17.375"